Indian market witnessed selling pressure on March 25 which pushed the S&P BSE Sensex below 38,000 while the Nifty50 also broke below its crucial psychological support at 11,400 levels during the day. Zee Entertainment, Vedanta, Bharti Infratel, JSW Steel and UPL were among top losers on the Nifty, while gainers include IOC, ONGC, Coal India, HPCL and Power Grid Corp.
On Friday, all three major US stock indexes registered their biggest one-day percentage losses since Jan 3 with the Dow sliding 1.8 percent, the S&P 500 off 1.9 percent and the Nasdaq dropping 2.5 percent. Concerns about the health of the world economy heightened last week after cautious remarks by the US Federal Reserve sent 10-year treasury yields to the lowest since early 2018, said a Reuters report. A weaker-than-expected reading of US factory activity in March, along with similarly dour reports from Europe and Japan, helped send US Treasury yields into an inversion with the spread between yields of three-month Treasury bills exceeding those of 10-year notes for the first time since 2007, it said. "The US stock market tumbled on Friday as investors digested an ominous warning sign. Interest rates on long-term government debt fell below the rate on short-term bills. 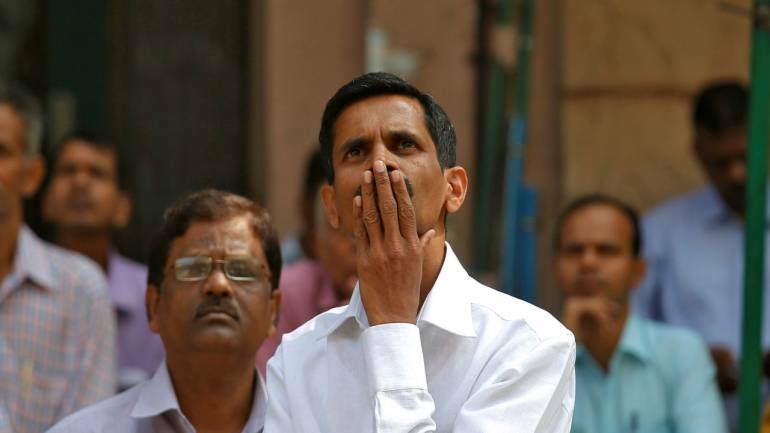 That's often a signal that a recession is on the horizon," Shrikant Chouhan, senior VP (Technical Research), Kotak Securities told Moneycontrol. It looks like traders are booking profit at higher levels. After rallying for 7 consecutive sessions last week from March 11th to March 19th, Nifty witnessed selling pressure around 11500-11600 levels. For the week, the index rose just about 0.26 percent. “Markets showed some strength but with a lower velocity. The rally wasn’t with the same thrust and momentum as the previous week as certain sectoral pockets experienced minor profit booking,” Jimeet Modi, Founder & CEO, SAMCO Securities & StockNote told Moneycontrol. “But, by the close of the week, massive amount of profit booking was seen across the board. In the meantime, all brokerage houses have turned positive and are upgrading their target prices. But when Nifty was around 10,000 in October 2018, the same brokerage houses were equally bearish. At extremes nearly everyone is wrong,” he said. Strong rally seen in the NiftyBank was one of the contributing factors which pulled Nifty as well as Sensex above crucial resistance levels. However, there are some signs of tiredness at higher levels. But, experts feel that investors should use dips to create long positions. "FIIs love for Indian banking stocks is known to the world, FIIs are buying HDFC Bank, ICICI Bank, Kotak Bank & Axis big time, these 4 stocks having the weight of more than 75% and buying in these 4 stocks helped Niftybank to rally over 2500 points in few weeks," Prakash Pandey, Director, Fairwealth Securities told Moneycontrol. "Bank Nifty is having a strong base around 29000-28800 zone and dips towards 29000-28900 will be a great buying opportunity for the near term target of 30500," he said. Despite the recent rally, Kotak Bank seems attractive and we see the target of Rs.1500 on the stock in next 3-4 Months. The Nifty50 index extended gains towards 11572 mark on Friday but it failed to hold the same and drifted towards 11450 zones. It negated its formation of higher lows after eight trading sessions which implies that some pause in positive momentum is visible at higher levels. "The index formed a Bearish Candle on daily scale while Doji Candle on a weekly scale which indicates an important hurdle near to 11550 zones," Chandan Taparia, Derivatives & Technical Analyst at Motilal Oswal told Moneycontrol. "Now, if the index sustains below 11550 zones then some profit booking could be seen towards 11400 then 11333 zone while on the upside hurdle is seen at 11550 zones," he said.